This week, the children had fun taking part in some competitive sports during their PE lessons. Each house had a chance to win points by taking part in Olympic style games. Thank you to Mrs. Potts and Coach Del for organising and running the games. 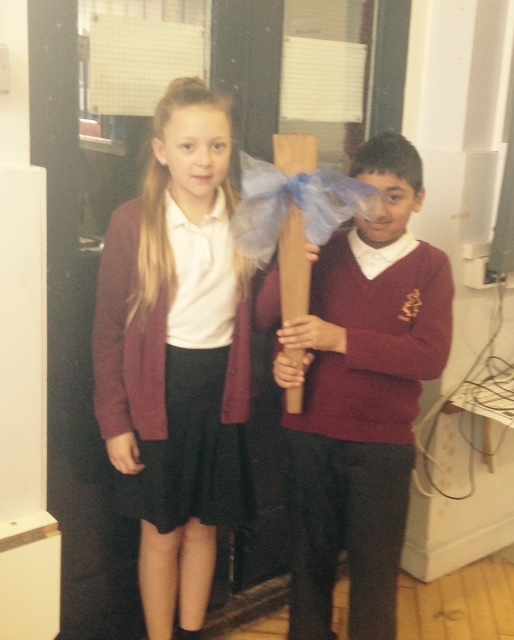 Two pupils received the torch on behalf of the blue team, who won the competition. Don’t forget that the next meeting will be at 7.30pm on Wednesday 13th May at the Orange tree pub on Orange Tree Hill. This will hopefully allow working parents to join us. I have had some feedback from the Mathletics online scheme. Please let me know if you have used the scheme and tell me what you thought of it, as a representative from the company will be calling me next week. A few parents have said that they are having problems logging on to Bug Club. On the log in page, there is a link called ‘will it work on my computer?’ Please try clicking on here to see what the problem is. If you have any other problems using the scheme, please come and ask Mrs. McCormack, our English co-ordinator. I am sure you will all join me in wishing our Year 6 pupils every success in their SATs tests next week. They have all been working incredibly hard and are determined to do their best. Thank you to Mr. Evans, Mrs. Hood, Mrs. Johnson, Mrs. Howson, Miss Luxford and, of course, parents and carers, for helping the children to prepare. Well done to class 3 and class 1 for reaching our attendance target of 97% this week. Well done to Bonny-Blu Kedadi and Elaina Goodison who have earned their place in this week’s Gold Book for excellent classroom behaviour. Taylor Moss received the Headteacher’s award this week for his positive attitude to school and his contribution to school life. These days fall either side of the May half-term week.